TUESDAY, Jan. 9, 2018 (HealthDay News) — Americans are being hit with one of the worst flu seasons in years, with misery now widespread across 46 states, health officials say. To make matters worse, the flu vaccine is not a good match with the H3N2 flu strain that is dominating the season so far, she said. At this point, 80 percent of reported flu cases are this more severe strain, according to the CDC. H3N2 also tends to be very bad news for the very young and the very old. Dr. Matthew Mullarky, an emergency room doctor at St. Joseph Hospital in Orange, Calif., told the Los Angeles Times that half of the patients he saw on a recent shift were so sick they had to be admitted to the hospital. Most were older than 85, and struggling with both the flu and pneumonia. “It’s incredibly scary,” Mullarky added. The CDC doesn’t keep track of how many adults die from flu, but it can be as many as 60,000 in a bad season. The agency does track child deaths. So far, 13 U.S. kids have died from flu, Brammer said. This year’s vaccine contains the same mix as last year’s shot. That vaccine was 43 percent effective against the H3N2 virus and 48 percent effective overall, according to the CDC. It’s too early to judge the effectiveness of this season’s vaccine, but Brammer said she expects it to be about the same as last year. A recent report about the vaccine in Australia found it was only 10 percent effective against the H3N2 flu strain in that country. But Brammer thinks that estimate is much too low. Even though vaccine may not be well matched, it doesn’t mean you shouldn’t get a flu shot, Brammer said. It’s still the best protection against H3N2 flu and other flu strains, such as H1N1 and B viruses, which are also circulating, she said. Brammer hopes that the flu has peaked in the areas where it has been most severe. The South has been suffering with flu for several weeks, and it may have peaked there, she said. “It should start to decline in the next week or so,” she said. But people in places where flu has been less active should brace themselves for the coming onslaught. Consider what is unfolding in New York state. “We are seeing a significant increase in cases of flu, and people being admitted to the hospital with flu,” said Dr. Bettina Fries, chief of Stony Brook Medicine’s division of infectious diseases, in Stony Brook. The majority of patients being admitted to the hospital for flu are either very young or older than 65, she noted. 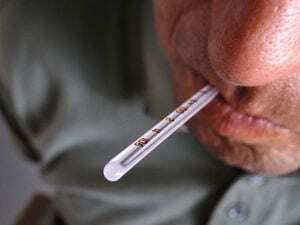 The unusually cold winter may be adding to the spread of flu, Fries said. It’s hard to tell, Brammer said, when this year’s flu season will peak. Flu can hang around through winter into spring, she noted.